If you are in the market for a fun-to-drive crossover, the 2017 Volkswagen Tiguan might be just what you are looking for. It offers sporty handling that like many of its competitors doesn’t rob you of comfort. Under the hood sits a perky turbocharged engine that offers plenty of performance. Inside, you will enjoy a spacious, quite ride surround by plenty of high-tech gadgetry. For the 2017 model year, VW has made a few slight changes to the Tiguan. These start with the elimination of the SE and R-Line trim levels. There are two new trim levels, the Wolfsburg Edition, and the Sport model, which have essentially the same trim as their predecessors. All models will now come equipped with a 6.3-inch touchscreen. Under the hood of the Tiguan lies a four-cylinder engine that seems to be hiding all it has to offer. This turbocharged 2.0-liter inline four-cylinder engine pumps out a very healthy 200 horsepower and delivers 207 pound-feet of torque to the ground. Front-wheel drive and a six-speed automatic transmission come standard on all models, but if you want a crossover that will take you virtually anywhere in any condition, you may want to add the optional all-wheel drive system. Under testing, the front-wheel drive version managed to go from zero to sixty miles per hour in 7.5 seconds. This is considered to be well above average for a vehicle in this class. 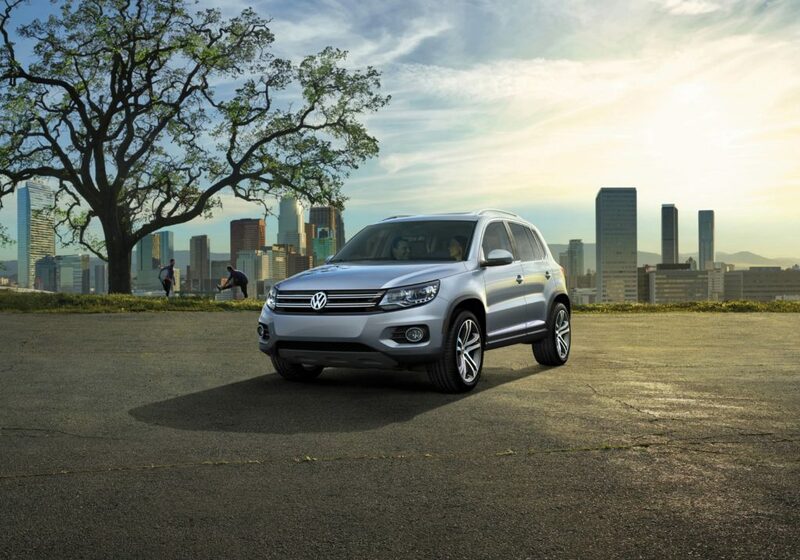 Not only is the Tiguan powerful, but is also manages to achieve high marks for overall fuel economy. The front-wheel drive version hits 22 mpg, while the all-wheel drive comes in slightly lower at 21 mpg. For 2017, what was an optional infotainment system has now become the standard. It offers an easy to use menu layout along with controls that have been rated as “Best in Class.” This system is designed to work with both Apple CarPlay and Android Auto. Two people can connect their cell phones via Bluetooth to the audio system for simultaneous DJing. The audio system offers impressive sound via 8 speakers and has a CD player, a USB port, auxiliary jack, dual SD card slots, HD and satellite radio, and full smartphone integration. If you want more from your entertainment system, simply upgrade to the SEL trim and your Tiguan will come equipped with a top of the line Fender audio system. Other features available include power front seats in the Wolfsburg Edition and an enhanced rearview camera in the SEL trim. If you are ready to learn more about the Volkswagen Tiguan crossover, we invite you to Durham Volkswagen to take one out for a test drive. Call us at (919) 493-7411 to schedule your appointment today or come on in and see what the fuss is all about.